Three inch handcrafted Native American Dream Catcher wrapped in real leather. The web is spun with authentic sinew. 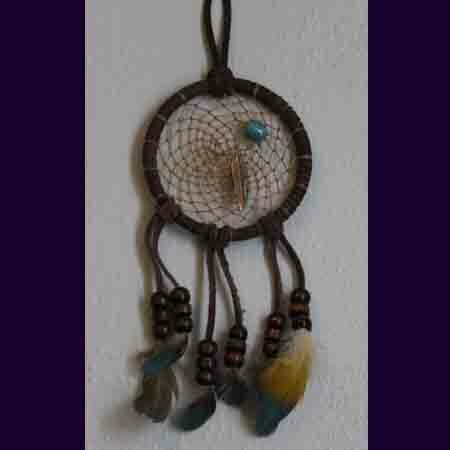 A feather charm and turquoise bead can be found in the center of the Dream Catcher attached to the sinew. Six strands of leather are carefully attached along with wooden beads and genuine feathers. The Dream Catcher would be placed above the person’s head, commonly each child. The Dream Catcher denotes the clutching of bad dreams in the web one would have. With the rising of the morning sun the dreams are carried away by the dance of the beautiful feathers. Your specially handcrafted Dream Cather will be sent wrapped in bubble wrap for protection and then placed in a plastic bag. Your Dream Catcher will arrive in a cardboard box inside either brown shipping paper or shipping envelope. I have been a crafter for most of my life. I learned to knit when I was 8 years old from an older lady by the name of Madora. She owned a yarn shop so who better to teach me. I am very flexible when it comes to crafts. There is not any one specific craft that I like over another. I genuinely like them all. I have an earned doctorate degree along with a masters and a bachelors. While obtaining my college degree’s I was a single parent. I used making crafts as my “get away” and even taught my son a thing or two. Upon graduation I was fortunate to find a position as an Assistant Professor when tragically my life-long disability caught up with me. The money I generate from sales is put right back into my business for supplies, fees, etc. Without this extra income I may not be able to achieve what I love best and that is making and creating beautiful works of art. I believe my products are of the highest quality and therefore stand behind each and everything I create and make. I will be adding additional crafts as the seasons change. Please check back often. The majority of my inventory consists of Christmas items such as cards, quilted wall decorations, stuffed door knob hangers and stuffed Christmas tree decorations. Additionally I create and make a few special/any occasion cards such as friendship and sympathy. I am also Native American and therefore will be adding authentic Dream Catchers to my site along with other Native crafts. I do hope you enjoy my crafts as much as I love making them. There is much time, devotion and love into each and every individual piece. If you should find the need for a special hand crafted item, please contact me to discuss the details. I would love to help in anyway. This also includes items you may have started but just can't quite get them finished. Let me know and together we will be successful.